VYARA.APR.10: The C.N. Kothari Homoeopathic Medical College celebrated the 258th Birth anniversary celebration of Dr.Samuel Hahnemann in collaboration with Homoeopathic Association of India (HMAI) Vyara Unit. 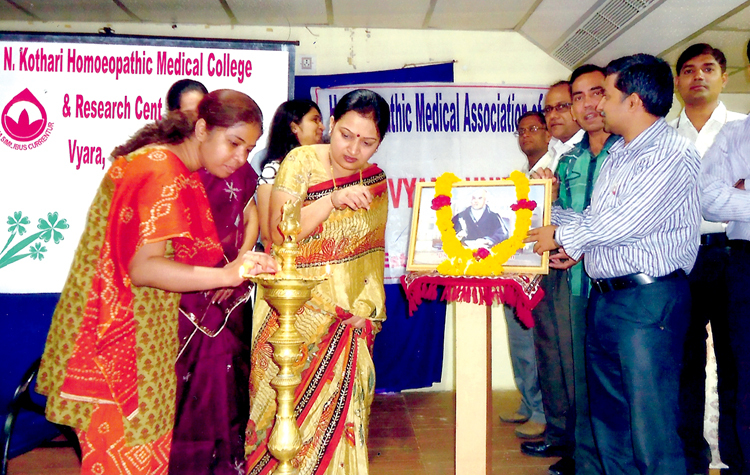 Dr. (Mrs.) Jyoti Rao, Principal of the college inaugurated by lighting the lamp and garlanded Hahnemann’s portrait. The faculties, students paid their tributes. Dr.P.R.Patel, Dr. Meena Kalra, Dr. Amitrai Shah & Dr.Sunil Gupta addressed gathering with a slide show on Hahnemann’s history and video clippings. Miss. Dimple Patel highlighted the few important events of Dr.Samuel Hahnemann’s life. Vote of thanks was proposed by Dr. Piyush Gujarathi at the end. A free medical camp also organized. A team of doctors Dr. Bhavin Modi, Dr.P.R.Patel & Dr.Bhavna Patel treated 54 patients. Dr. M. K. Burad, President HMAI, Vyara unit Dr.Swapnil Pardeshi & Miss. Shuchi Shah organized this event.